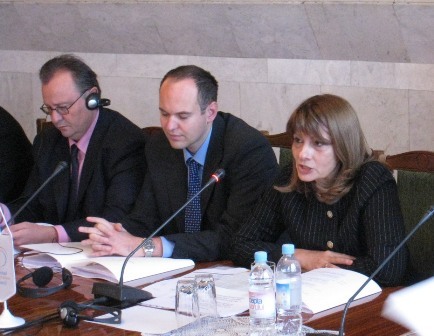 CHISINAU/SARAJEVO – Deputy Secretary General of the Regional Cooperation Council (RCC), Jelica Minic, and Senior Experts of the organization started today in Chisinau a series of presentations accross Southeast Europe on RCC mission, priorities and activities. The presentations will focus on the six RCC priority areas: economic and social development, energy and infrastructure, justice and home affairs, security cooperation, building human capital, and parliamentary cooperation. The aim is to bring the RCC work closer to a wider circle of officials in Southeast Europe and to establish direct links between RCC experts and senior and mid-ranking experts from the governments, ministries, agencies, chambers of commerce, unions of employers, trade unions and other relevant officials from RCC members in the region. The presentations will encourage discussions on concrete proposals for enhancing regional cooperation. The wider purpose is to harmonize individual countries’ plans with RCC activities and priorities, in order to achieve faster consolidation and greater efficiency of regional processes and initiatives, and speed up development and EU integration of the region. The series of presentations is to take place between 1 October and mid-December 2008 in the capitals of RCC members from Southeast Europe. After the presentation in Chisinau, the RCC experts will hold presentations in Bulgaria on 15 October, and Serbia on 10 November. A version in Bosnian language is available HERE.